Alejandro Jodorowsky was born in “1920 or 1930,” film critic J. Hoberman writes in his book Midnight Movies, “to Russian-Jewish parents in Iquique, a small copper and nitrate port on the northern coast of Chile.” The Holy Mountain, filmed entirely in Mexico, is not kind to gringos. In those first 25 minutes, a band of white American tourists delight in filming the fresh corpses of indigenous brown Mexicans, the victims of a senseless firing squad. The white men and women are dressed like a Taco Bell, with tacky serapes and cheap over-size sombreros. They turn their cameras on the dead with glee. To stack the parallels between West and Jodorowsky even higher, here’s the filmmaker in an interview with the Los Angeles Free Press, “Maybe I am prophet. I really hope one day there will come Confucius, Mohammed, Buddha, and Christ to see me. And we will sit at a table, taking tea and eating some brownies.” Baked goods, deities. All my BFFs are gods. In The Holy Mountain, the thief eventually meets a spiritual guide (played by Jodorowsky), who promises to walk him down the path to immortality. This path leads up a holy mountain. Ultimately, the thief doesn’t reach the top. His guide encourages him to leave with the woman who’s been tailing them. They get married and head back down the mountain with her chimpanzee friend. As the film ends, Jodorowsky&apos;s character explains that "we have attained reality," and then the camera zooms out to reveal the film crew shooting the scene. Go forth and be real. The Holy Mountain, then, is a kind of cracked step-by-step handbook for self-realization, powered by blasphemy, Freud, Surrealism, counterculture politics/drugs, and Buddhism (among other things.) But there’s a scene early on in the movie that&apos;s more illuminating about the guts of the Yeezus tour. After coming down off the cross the band of little boys mount him to, the thief wakes up in a room full of plaster casts of himself. He roars at the sight of all these copycats. The copies are more blasphemous than anything else in sight—even the crucified lambs—graven images of the true god. So, to assert himself, this god shouts louder than everyone else. To assert himself, Kanye West stunts. He does what no one else can, and he does it bigger. You can’t believe what you’re seeing (and hearing), that someone pushed to make this happen, got others involved in such a personal and inscrutable adventure. Where did Kanye West find the guy willing to dress up like White Jesus? Where did Jodorowsky find the one-eyed man willing to kiss the hand of the little girl after popping out his eyeball on camera, revealing the secret red inside of his body to the viewer? This is crazy. It’s awesome for its craziness. That’s one way of looking at the Yeezus tour. But certainly not the only way. 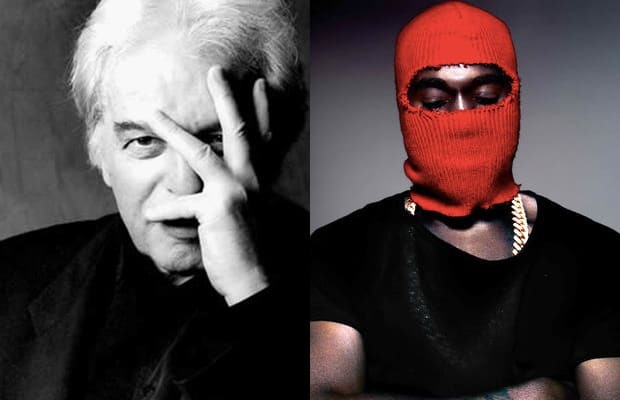 Keep reading for side-by-side comparisons of the Yeezus tour and Alejandro Jodorowsky&apos;s Holy Mountain.